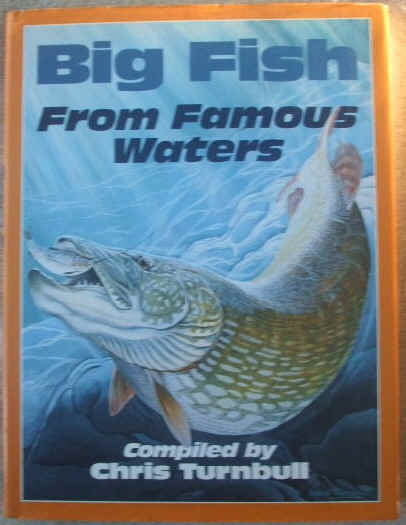 First edition, first print hardback of BIG FISH FROM FAMOUS WATERS Compiled by Chris Turnbull and published by David & Charles. Newton Abbot, Devon in 1990. Illustrated by renowned angling artist, Chris Turnbull. Contributors include Chris Yates, John Bailey, Chris Ball, Neville Fickling, Pete Garvan, Steve Harper, Robert Jones, Peter Stone, Tony Miles, and many more. The book is in very good condition (Clean blue cloth boards, gold lettering on spine) with slight wear to the dust jacket, which is not price clipped (light creasing to the edges mainly around the spine, small nick to the bottom spine corner, thumbnail closed tears to the top and bottom corners at the back). Internally, the pages are clean and tight and there are no tears and no inscriptions. "This unique book sets out to chronicle the highest moments and achievements of Britain's specimen hunting movement throughout the eighties, a decade unparalleled in angling history. Big Fish from Famous Waters takes an in-depth look at the handful of extraordinary fisheries which throughout that period constantly stole the headlines, and in so doing the book tells the stories of many of greatest angling adventures ever. Because it is outside the realms of possibility that any one angler on his own write knowledgeably or intimately of all these waters, the editor has gathered together a team of anglers who themselves contributed to realising the tremendous potential each water has to offer. They are the very men whose outstanding achievements assured these waters of their rightful place in this hall of fame. This is not another dry instructive book on fishing, nor is it a tedious collection of angling facts and figures. Instead it is a compilation of the greatest angling adventures - the stories of many of the greatest angling achievements of the specimen hunting fraternity throughout a period which witnessed this movement grow, come of age, and then proceed to catch more huge fish than at any other time in angling history. To help bring the spirit of these great stories to life, the book is lavishly illustrated with over one hundred line drawings, photographs and superb full colour paintings, making this fascinating book a must for every keen angler's bookshelf." Contents include: Redmire - The Pool of Dreams, Christopher Yates; Kent's Secret Perch Lake, Pete Garvan; TC: The Oxford Water, Tony Miles; Hardwick Chub, Peter Stone; Tring Reservoirs and That Man Wilson, Chris Turnbull; Wensum Giant, John Bailey; Yateley Carp, Chris Ball; Wessex Barbel - A Legend in Decline, Pete Reading; Queenford Lagoon: Dream-maker, Heart-breaker, Phil Smith; Wensum Barbel, Steve Harper; Fenland Zander: After the Goldrush, Neville Fickling; A Decade of Johnsons' Tench, Chris Turnbull; Savay: Queen of the Colne Valley, Andy Little; Highs and Lows of Broadland's Glory, Chris Turnbull; River Thurne Pike, Neville Fickling; The Swithland Story, Alan Rowden; Llandegfedd: The Instant Legend, Robert Jones; Conclusion: Into the Nineties, Chris Turnbull. 192 pages. Illustrated with black & white and colour photographs, drawings and maps throughout.